Home » Posts » Attentionology for K-5 Teachers » All Aboard for a New School Year! Elementary school teachers in many parts of the world are busy preparing their classrooms for the opening of the 2011 – 2012 school year. Despite budget restrictions, educators are creating colorful learning environments – new bulletin boards to welcome students – bright books stacked on classroom shelves ready for readers – clean (at least as clean as possible) cubbies waiting for backpacks – table sets or desks in clusters or lines that will soon be centers of student activity. All Aboard for Learning is a classroom-tested attention-getting trick. You can set up a train station, so to speak, ahead of your students’ arrival by buying or making train car shapes for a bulletin board outside your classroom door. Post a welcome headline that suits your grade level like the Kindergarten teacher did for the bulletin board in my blog pic. 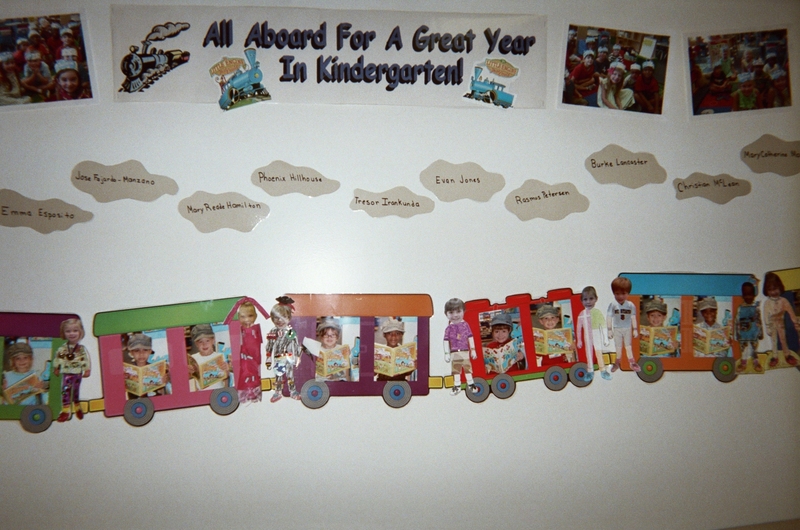 On the first day of class ask the kids to bring in photos of themselves to tape or glue to the train cars. With passengers in place , you’ve set the stage for a year of travel to all kinds of destinations! Where can you take your class? The possibilities are endless, especially if you have classroom technology like whiteboards that allow you to project web-based virtual train trips on them. Check out The Amtrak Unlimited Virtual Tour of America or trains that travel across Canada, the UK, Europe, Asia, South America and Australia. The Wonderful World of Words – I use a board in front of the class that I can write on for this “station.” Teachers can use this “station” in different ways to help children master language skills. For students in grades K – 2, you can write words on the board that rhyme with each other like cat, hat, etc. You can use this “station” for something as simple as introducing a book you’re about to read to the class. Write the title on the board. You may even decide to dedicate a portion of your board to serving as “the wonderful world of words” for the whole year. The Private Quiet Writing (or Coloring) Zone – I invite kids to jump back on board to visit the “private quiet writing (or coloring) zone for individual language arts activities. Attention-getting? Yes! These imaginary “train stations” are so engaging that teachers I’ve worked with use them year after year. Here’s something else that’s cool…once you introduce “train stations,” you can simply refer to them without “boarding”, and students will know what to expect all year. Add surprises to catch more attention! For example, after school one afternoon, tape paper “train tickets” to the bottoms of your students’ chairs. Use clip art to make train tickets or create your own design. The next day, invite the class to peek under their chairs. They’ll be delighted to find train tickets. Where to now? How about Math Mountain? Learning “stations” can suit a range of curriculum areas. “Count with me…1…2…3…you get the idea! The Reading Ranch is another possible destination. Theater-goers may be required to suspend disbelief, but believe me, K – 5 students love opportunities to travel, with age-appropriate planning, any way they can beyond their classroom walls. ‹ Bring a Dog to School! 6 Pings/Trackbacks for "All Aboard for a New School Year!"